A Nintendo 64 emulator was briefly available on Xbox One earlier this week, but Microsoft yanked it from the store today. Sad news for people who yearn to play Paper Mario on an Xbox. The emulator Win64e10, which has been a Universal Windows App for months now, popped up Sunday on the Xbox One. Microsoft’s August update for their prestige console allowed Xbox One users to download and install any Windows apps that have Xbox support. 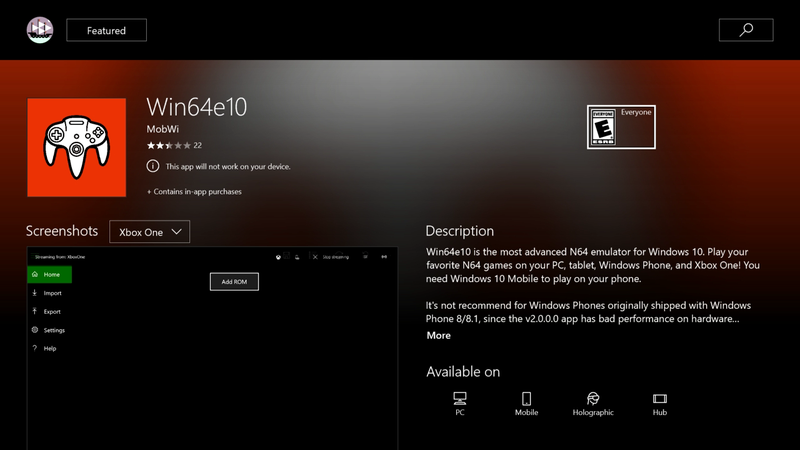 The folks behind Win64e10 made their emulator compatible with the Xbox One over the weekend, selling it for $10 and advertising that it could play games like Super Mario 64. It’s not clear why anyone would spend money on an emulator when so many of them are available for free, but the app had novelty value. Clearly Microsoft wasn’t thrilled about that—they’ve now removed Xbox One support from Win64e10, although you can still buy it on other platforms. Emulators are not illegal, although distributing unauthorized ROMs violates U.S. copyright law. Still, Microsoft appears uninterested in allowing emulation on their console—earlier this month the company also removed an NES emulator from the Xbox One.